Ashampoo Snap is a very powerful and feature-packed screen capture utility which can record exactly what's going on on your PC screen. It supports both video and still images. When working with screenshot images, Snap includes some excellent image editing tools which work well when creating tutorials or other presentations. As a video capture utility, Ashampoo Snap doesn't disappoint! 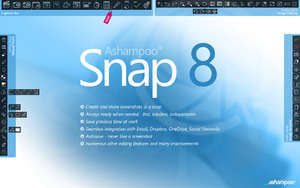 Ashampoo Snap 10.0.8 is a shareware program and can be used as a demo to try the software until the free trial period has ended. A full version of the program is available after the trial period ends. For security reasons, you should also check out the Ashampoo Snap download at LO4D.com which includes virus and malware tests. Additional screenshots of this application download may be available, too. 3 out of 5 based on 63 ratings.